It is rugged - and beautiful in its reddish hue and shadow. We think of the desert as rugged and barren...but the artistry is amazing! 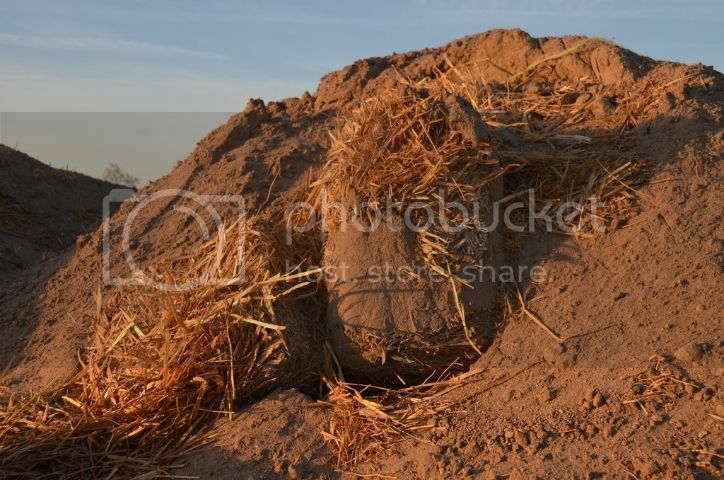 This truly looks like some leftovers from building a straw house or making adobe bricks? Happy Sunday! I see a head with hair blowing in the wind! I like this, the colour shades that create a feeling of warmth. Before I even knew what a blog was, let alone have one, I would probably not considered this as photo worthy. I am so glad to be with you in seeing this as art- the different textures also appeal to me. Looks like a faceless head. Proving that not every dirty picture is obscene. Artistic and a solemn view. Hope you had a wonderful Easter, pepz.